Catch the eyes of family and friends with this modern and sophisticated planter set. 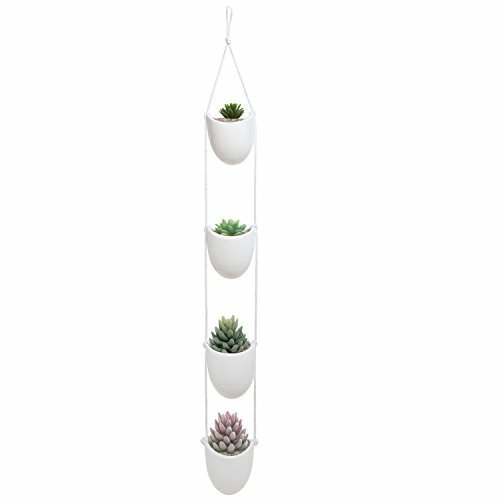 This ceiling-mounted plant pot set comes with 4 white ceramic plant containers suspended between 2 lines of sturdy white rope. Plant your favorite succulents or other small potted plants in the modern elegance of these ceramic bowls, or use these decorative pots to show off a variety of other decorative items. Add a dash of modern style and an eye-catching decorative touch to your home with this set of ceiling-mounted planters. Approximate Dimensions (in inches): 5 W X 41.25 H X 3.75 D.
Bring modern design to your home with this rope & ceramic hanging planter set. Features 4 small planter pots that are each suspended between 2 lines of white rope. Ideal for live potted plants, but can also be used to hold other decorative items from around your home, including seashells and potpourri.